You can find yourself with moldy carpet after a pipe breaks, or your roof leaks, or even simply leaving a window open during a bad rain storm. Carpet mold is also common in carpeted bathrooms, where moisture results from steamy hot showers and water may splash out of the bathtub. Mold in carpet poses the same health risks as mold growing on any other household surface or material, including risks of allergic reactions, asthma attacks, pneumonia and other respiratory infections. 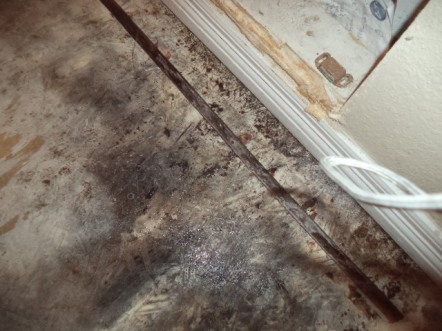 Mold also spreads easily from carpet to other surfaces, including floorboards. Because it is very difficult to remove mold from porous surfaces like wood, if your floorboards become moldy, you'll probably have to remove and replace them. As you might imagine, this can quickly become a time-consuming and costly undertaking. We frequently tell people that it is better to prevent mold than to have to clean it up, if at all possible. While you can't always prevent it, there are things you can do to help avoid moldy carpet. Don't use carpet in rooms with high moisture content, such as bathrooms, kitchens and laundry rooms. Use hard, nonporous flooring like tile or linoleum instead. Close windows when it rains and make sure windows seal tightly. Fix any leaks in your roof or leaky pipes promptly. Clean up any spilled liquids promptly. For small spills, blot the area with dry cloths or paper towels until you've soaked up as much moisture as possible, changing the towels as often as necessary. For larger spills, after blotting the area as dry as possible, place a fan near the area to increase air circulation and speed drying time. In the event of flooding, carpet will most likely need to be removed and replaced. Doing so immediately, before mold begins to grow, can prevent future problems. 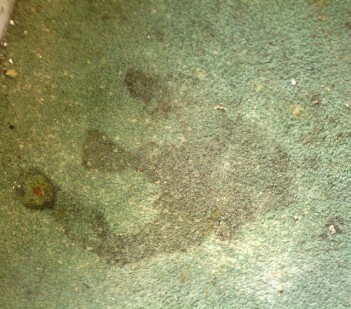 Unfortunately, it is not possible to completely remove mold from carpet. If you get mold in your carpet, you'll need to remove the carpet and replace it. The carpet must be removed carefully, with specific safety precautions in place, in order to prevent the spread of mold and to avoid further exposure to potentially hazardous mold spores. Taping heavy plastic over heating and air conditioning ducts to prevent mold spores from entering the duct work. Also cover hi-hats with plastic. If you have carpet with mold on it, there is a good chance the padding beneath the carpet is also moldy, so it should be checked carefully and removed and replaced if needed. It is also possible for the floorboards themselves to be moldy, so those should also be examined carefully. If floorboards are moldy, they must also be removed and replaced. Because mold spreads easily, if you have mold on your carpet, you may have mold elsewhere in the home. We recommended inspecting the entire house to be safe. The U.S. Environmental Protection Agency (EPA) recommends getting professional assistance with mold removal if you have mold covering an area greater than 10 square feet. If you've got a large area of mold, or if you just want some expert advice about handling the mold removal, we suggest scheduling a free consultation with an experienced mold removal professional at your place of residence. Follow the link for a list of qualified professional near you offering free home inspections.